ISIS terrorists can get fooled easily, and this time they fell for one of the oldest tricks in the book. In the video, a young Iraqi soldier is pinned down by an ISIS sniper. The soldier was able to fire off a few shots at the sniper but seemed to be trapped with few options. The ISIS sniper was then able to fire a shot that was only several inches from the soldier’s feet, which was frightening. At this point, the soldier knew that he needed to come up with a creative plan to safely escape from the sniper. The soldier decided to place his helmet on the tip of his weapon and lift it up into the sniper’s view to make it appear as if it was his actual head. Interestingly, this decoy fooled the ISIS sniper as he took a shot. At this point, the sniper thought that he had taken out the Iraqi soldier, but he only shot at the empty helmet. The Iraqi soldier used this as an opportunity to quickly run away to safety. Clearly, this quick decision by the Iraqi soldier saved his life, otherwise, the sniper probably would have closed in on him. The video itself is quite comical because the ISIS soldier was naïve enough to think the helmet was the soldiers head. Using decoys is a common trick to get snipers to think that they have a direct shot on the enemy. This is yet another instance of ISIS getting outsmarted by its adversaries. It’s no wonder why they are increasingly losing ground in the Middle East. This proves that it takes a sharp and experienced mind to be successful on the battlefield. It’s also a coincidence that a security camera was able to record this entire exchange of fire. It’s not uncommon for there to be a network of cameras placed around the battlefield, so support units know what is going on, but these cameras only occasionally record footage like this that is interesting. The Iraqi soldier runs to safety after distracting the ISIS sniper. This entire exchange of fire seems like something out of a movie rather than real-life. It’s almost too perfect that this young Iraqi soldier was able to fool the ISIS sniper to save his life. This is one of many embarrassments for ISIS as they continue to lose their relevance. 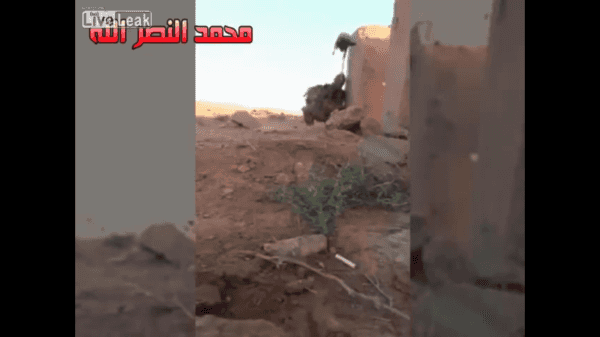 Check out the video below, as it shows how the Iraqi soldier used his creativity to get him out of this dangerous situation and into safety.